A sweeping new proposal would turn a decrepit section of the BQE into a three-level TriLine park, similar to the Highline Park in Manhattan. Under the plan, the Triple Cantilever would become part of Brooklyn Bridge Park — the “cliffs” of Brooklyn Bridge Park — overlooking the park, the harbor and the skyline of Manhattan. BQE Town Hall Meeting A BQE (Brooklyn-Queens Expressway) reconstruction Town Hall has been rescheduled for Wednesday, April 3 at 7 p.m., at Plymouth Church, 57 Orange St., Brooklyn Heights. The Town Hall is being jointly sponsored by the Brooklyn Heights Association and A Better Way NYC. wide box, allowing pollutants to be collected and treated. The highway would be buried under the soil, plants and the walkways of the enlarged Brooklyn Bridge Park. The linear Tri-Line parks, each 1,880 feet in length and more than two acres in space, could contain gardens, walking paths, seating, bike lanes, exercise space and equipment, such as climbing walls, Baker said. These levels will be connected to each other, to the Promenade above and to the park below, through stairways, escalators, elevators or slides, improving access to the park from Brooklyn Heights and Downtown Brooklyn. “With no noise from the totally covered BQE the need for the berms in Brooklyn Bridge Park is removed and additional acres of usable park space created in the current park footprint,” Baker said. The plan doesn’t involve a “costly and disruptive temporary highway in this area,” he said. “Vehicle emissions in the above-ground tunnel can be captured and treated. The particularly dangerous particulate matter pollution from trucks can be scrubbed using electrostatic precipitators and other technologies,” he said. “This is particularly important along the BQE because of the proximity of playgrounds along the BQE route, some of them created by Moses himself.” It also preserves the current capabilities of the BQE and makes the BQE achieve federal standards in design and safety. “No more back-ups when a car is disabled — there will be a breakdown lane,” he said. The city’s Department of Transportation, which is now considering a number of BQE proposals, had not yet seen the plan as of Tuesday. However, it appears to address many of the concerns of local residents. A slew of alternate proposals An early proposal put out by DOT, which would replace the Promenade with a temporary six-lane BQE bypass while the structure underneath was rebuilt, was met with loud opposition by residents, who pointed out it would bring the noise and pollution of 153,000 vehicles a day up to ground level and into the neighborhood for a minimum of six years. Since it was released, a number of individuals and organizations have urged the city to use this window of opportunity to reimagine the BQE. A plan proposed by NYC Comptroller Scott Stringer would eliminate cars from the BQE, run trucks along a twolane thruway at the bottom level of the triple cantilever and turn the rest into a new linear park. 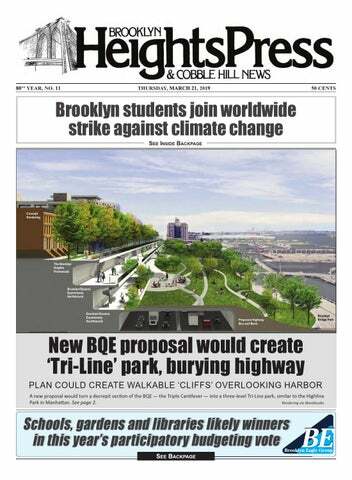 The Brooklyn Heights Association has submitted its own alternate BQE proposal designed by Marc Wouters Studio. This plan would run a BQE bypass along the edge of Brooklyn Bridge Park, as opposed to DOT’s proposal to run it along the Promenade. Another proposal, by Cobble Hill resident Roy Sloane, calls for a tunnel to bypass the BQE and cut across Downtown Brooklyn. DOT is also considering repairing the triple cantilever section of the BQE piece by piece, a process that could add up to two years to the timeline. Baker, a 30-year resident of Brooklyn Heights with his wife and three children, is chief executive officer and a director of Progenics, a pharmaceutical company that develops drugs to treat cancer. From 2003 to 2005, he was a director of New York Water Taxi. He is also the chair of the board of the Brooklyn Bridge Park Conservancy, but he emphasizes that the proposal is his own idea, not the Conservancy’s or the Brooklyn Bridge Park Corporation’s. “The Tri-Line Plan is a personal idea of mine and doesn’t relate at all to my work over the years with the Conservancy,” he told the Heights Press ___________________ To see the full plan, visit TheTriline.com. 212-239-6200 410 West 42nd St. The Slope Lounge presents Rock Band Showcase 2019 on Sunday, March 24th. Brooklyn Public Library presents LITFILM: A BPL Film Festival About Writers through March 24th. SAVE UP TO 25% ON TICKETS! * *Offer valid on select seats and select performances. MARCH 28 - 31 Use Code: BKEAGLE beacontheatre.com/bkeagle *Offer not valid on previously purchased tickets and cannot be combined with any other offer. 8 ticket limit. Disocunt is calculated off the original box office price. Service charges apply to telephone and internet orders. All sales are final – no refunds or exchanges. Offer may be revoked or modified at any time without notice and is subject to availability. Other restrictions may apply. Offer expires March 31, 2019. Accesible and companion seats are available via the Disabled Services Department at 888-609-7599. © 2019 MSG Sports & Entertainment Holdings, LLC. All rights reserved. A documentary on the amazing life of actress and comic, Gilda Radner. Gilda Radner passed away from ovarian cancer in 1989 but her spirit lives on! Discussion to follow after documentary. Possible Q+A with the Director. RSVP to https:// tealwalk.org/workshops/ or email info@tealwalk.org When: Thursday, March 21st, 6 p.m.
way cannot derail you when you are motivated, Aries. Just keep chugging forward and you can plow through any obstacles that spring up. ♉ TAURUS  Apr 21/May 21 Find a way to work a vacation into your schedule, Taurus. You can probably use a respite from the daily grind, and a change of scenery is just what the doctor ordered. ♊ GEMINI  May 22/Jun 21 Gemini, if you slow down and listen to others, you may learn something new about yourself. Sometimes you have to view yourself through another’s eyes. a friend to handle something you would much prefer to handle yourself, Cancer. Trust that this friend will do a good job and express your gratitude. ♌ LEO  Jul 23/Aug 23 Open your eyes to the bigger picture, Leo. Only focusing on the smallest details will prevent you from seeing the grand scheme of things. 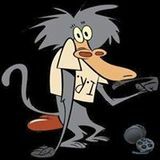 ♍ VIRGO  Aug 24/Sept 22 Virgo, an unexpected situation momentarily takes you off guard. Take a step back and reassess the situation. Some careful reflection will help you find a solution. ♎ LIBRA  Sept 23/Oct 23 Libra, when someone calls on you for advice, offer it without reading too much into why it is needed. You are there to lend support and a different viewpoint. ♏ SCORPIO  Oct 24/Nov 22 Take inventory of your weaknesses, Scorpio. By recognizing your shortcomings, you can become a stronger person and both your personal and professional lives will benefit. prepare for an adventure of sorts. The excitement may be mounting this week as you get all of the details in order. Start packing for travel. is nothing wrong with seeing the world through rosecolored glasses from time to time. Such a positive perspective might change your outlook for good. waste this week, Pisces. Be sure you have all of your details set and ready to go. Efficiency is key. BAM Rose Cinemas presents On Resentment through March 28th. With the weather starting to warm up, there’s no better time to stop by Grand Canyon Restaurant on Montague Street for a refreshing banana split. It’s the perfect dessert and at Grand Canyon you get it all, ice cream, syrup, the works . . . and you even get a cherry on top! It’s the perfect way to top off a delicious dinner at one of Brooklyn’s favorite restaurants. Welcome to the Ditmas Park Historic District. Ditmas Park is a Victorian house-fancier’s fantasy come to life. All those magnificent stand-alone, century-old frame houses with beautiful yards. All those circular porches topped with pointy-roofed turrets. And for visual variety there are stately brick mansions with front-entrance columns like the ones on Classical Greek and Roman temples. Admirers of this stellar Victorian Flatbush neighborhood should thank their lucky stars for Lewis Pounds. The real estate broker from Topeka, Kansas purchased land in 1902 and built Ditmas Park with a man named Delbert Decker, the city Landmarks Preservation Commission’s designation report about the Ditmas Park Historic District says. The property Pounds bought was part of the Van Ditmarsen family’s farm, in case you were wondering where the neighborhood’s name comes from. Pounds later went into politics. He served as the Brooklyn Borough President from 1913 to 1917. He later ran for mayor of New York City, but didn’t win. A walk around the neighborhood Pounds built is a rewarding experience if you crave Victorian architectural eye candy or simply want an hour of suburban-style serenity without having to leave Brooklyn. I strolled through the Ditmas Park Historic District the other day and found five especially scenic spots for you to see. Some patches of March snow were still hanging around here and there. I hope by the time you make your visit, green lawns will be visible and a few brave daffodils will be showing their faces. The corner of Ocean and Newkirk avenues is a fine place to start, at a red-brick, stone-trimmed mansion that Brooklyn builder Thomas Brush constructed as his home in 1899. The house at 1010 Ocean Ave. has a portico with tall Ionic columns. The mansion’s architectural style is a variation of Colonial Revival known as Georgian. Brush’s son-in-law, George Van Ness, bought the lot next door at 1000 Ocean Ave. The two men built houses that were meant “to complement each other in style,” Suzanne Spellen wrote in a 2014 Brownstoner.com story. An architect named George Palliser designed both homes. For many years 1010 Ocean Ave. was used as a synagogue and later a church. Medical offices currently occupy it. The west side of Ocean Avenue from Newkirk Avenue to the corner of Dorchester Road is included in the Ditmas Park Historic District. The houses are stunners. Another great pair of Ocean Avenue houses stands on the corner of Ditmas Avenue. Both are Colonial Revival-style homes with unusual silhouettes and front doors with small porticoes. Manly Cutter designed the one at 950 Ocean Ave., which was constructed in 1907. John Petit was the architect of the other one, whose address is 940 Ocean Ave. It was built in 1901 for Emily Driggs, who did important charitable work such as serving as the secretary of the Flatbush Boys Club and the president of the Women’s Auxiliary, the Landmarks Preservation Commission’s designation report about the historic district says. Petit’s name may sound familiar. He designed some of the most dazzling homes in Prospect Park South. Next, swing around the corner and walk to the East 19th Street block that runs between Dorchester Road and Ditmas Avenue. So. Many. Pretty. Houses. One especially eye-catching home, 456 East 19th St., is made of stucco and brick and has an unusually shaped roof covered with Spanish tiles. The white house is lovely 940 Ocean Ave.
Arlington Isham designed this house, which was built in 1903, the designation report says. But my very favorite East 16th Street house is a corner property whose address is 1601 Ditmas Ave. Fred Staples designed this big, bold Colonial Revival home for George Hodges, the designation report says. It was built in 1906. Now head over to the next street that intersects Ditmas Avenue, which is East 17th Street. One especially charming home on the block between Ditmas Avenue and Dorchester Road is Tudorstyle 501 East 17th St., which was constructed in 1908. George Showers designed it and a banker named Forest Wood was its first owner, the designation report says. Another handsome house, Colonial Revivalstyle 444 East 17th St., stands on the corner of Dorchester Road. It changed hands last year. The purchase price was $1.925 million, city Finance Department records show — and the seller had bought it for $800,000 in 2004. The East 16th Street blocks that are part of the This is 1010 Ocean Ave., which developer Thomas Brush built as his residence Ditmas Park Historic Dismore than a century ago. INBrooklyn photos by Lore Croghan trict are charming. Isham, the architect I THE INTERSECTION OF DITMAS AVENUE mentioned a moment ago, designed numerous bungalows and Colonial Revival houses on this street. AND EAST 18TH STREET Every Ditmas Avenue intersection in the landmarked section of the neighborhood is populated with eye-catching houses. Two of my favorites stand at the intersection of East 18th Street. The partly brick house at 1806 Ditmas Ave. was designed by Chappell & Bosworth and constructed in 1909. Its low-pitched Special roofs that extend past the edge of the house suggest Craftsman deDiscount sign, but otherwise its architectural style is Colonial Revival, the for Teachers, 25 years experience designation report says. Firemen, Another great house at this intersection is Colonial RevivalAppointment Only and Police! style 1807 Ditmas Ave. It’s pale yellow with turquoise trim, and a pine tree out front is practically big enough to be Rockefeller Center’s holiday tree. APARTMENT FOR RENT BAY RIDGE, BRICK BROWNSTONE 73rd St. btwn 4th & 5th Aves. 7013 Louise Terrace SAT. MARCH 30TH, 9am to 2pm Household items, China, Hummels, Crystal, Jewelry and so MUCH MORE! BAY RIDGE OPEN HOUSE Sun. Mar. 24th, 1-4 pm 97 80th St., B'klyn, NY Prime residential block, lg. detach. home, 10 rms (6 bdrms, 4baths) oversize fin. basement, sunny deck & yard, Large PVT driveway, 2 car garage, MUST SEE!! Pacific Blue Metallic, Stk# U481, Ash Int, 2.5L, 4-Cyl, Auto, Lthr, Clean Carfax, 46,235mi. Aspen White, Stk# U392, Charcoal Int, 2.0L, 4-Cyl, Auto, Alloys, Clean Carfax, 69,136mi. Black Clearcoat, Stk# U476, Blk Int,3.6L, V6, Hard Top, Clean Carfax, Nav, 53,304mi. Brooklyn. All services entrusted to Clavin Funeral Home. held on Wednesday, March 13 at Saint Andrew the Apostle Church in Bay Ridge, Brooklyn. All services entrusted to Clavin Funeral Home. Walter J. McCarroll passed away peacefully in his home on February 26, 2019. Lifelong resident of Bay Ridge, Brooklyn. Senior attorney for over 50 years in the NYCTA legal department. Proud member of the Ancient Order of Hibernians and Mensa. Walter enjoyed the game of chess, accompanied by a martini. Walter was a true friend and he is survived by many loving and caring friends. A Mass of Christian Burial was held Monday, March 4 at Saint Andrew the Apostle Church. All services entrusted to Clavin Funeral Home. • Spring fever isn’t just a saying – experts say the body’s makeup changes due to different diets, hormone production and temperature • The term “Spring” for the season has been used since the 16th century. • For years I was against organ transplants. Then I had a change of heart. • Two years ago my doctor told me I was going deaf. I haven’t heard from him since. • The first Spring flower to bloom is often the daffodils. • I asked my girlfriend to rate my listening skills. She said, “You’re an 8 on a scale of 10.” I still don’t understand why she wanted me to urinate on a skeleton. • Children grow faster during Spring. • The guy who stole my diary just died. My thoughts are with his family. • Before Spring was called Spring, it was called Lent in Old English. Brooklyn facility. Various shifts available 9am-5pm and publications and websites, located in both Bay Ridge 2pm-10pm Monday through Friday. Self-starter that is and Downtown Brooklyn. energeticand organized. Job duties include data entry We are talented, experienced repand filing in a high volume, fastlooking paced workforenvironment. work growing sales division Candidate shouldresentatives have computertoskills, thewith abilityour to multiin print and digital advertising. task and meet deadlines. Will train the right candidate. • Walktotowmccarthy@empiremerchants.com work Please send resumes or go to www.empiremerchants.com • Make your own morning or afternoon Click “careers” & search for Customer Service four-hour shift Representative position & click apply. • Base salary, plus generous commission • Bonus opportunities Must have: basic computer skills, positive attitude, be fluent in English, and have a clear phone voice. Bilingual is a + Great opportunity to make full-time income with a part-time schedule. Vote week opens on March 30 for participatory budgeting in New York City, and dozens of schools, libraries, gardens and senior centers have their fingers crossed. Participatory budgeting allows neighborhood residents to vote to fund community projects that are important to them but are often overlooked in the city’s standard budgeting process. Brooklyn’s City Council districts have been the leaders in this grassroots effort throughout its eight years of operation. In New York City, voters in the participating districts — 11 of 16 in Brooklyn — get to decide how to spend more than $1 million of their councilmember’s $5 million discretionary budget. Councilmember Stephen Levin, of Brooklyn Heights and Greenpoint, has allocated $1,520,000 from his budget this year to participatory budget voting. Projects range from buying books for the Williamsburg Library branch, to expanding garden plots at the Gowanus Houses, buying laptop carts for the Dock Street school in DUMBO, outfitting the Vinegar Hill Community Garden with water and electricity and buying AV equipment for P.S. 307 in Vinegar Hill. Participatory budgeting requires substantial work to solicit and vet ideas from the community. Volunteers help develop the ideas into proposals that go onto the voting ballot. Luckily, voting is easy — it can be done in person, online or on LinkNYC street kiosks. This year, you can vote for as many as five project proposals on your district ballot. Residents can vote to fund local projects starting March 30 through participatory budgeting in New York City. One project in Councilmember Stephen Levin’s District would supply AV equipment for P.S. 307 in Vinegar Hill. Brooklyn Heights Press photos by Mary Frost Local schools, parks, senior centers and libraries are often the beneficiaries, but many people are not even aware of the vote, which is open to all residents of participating Council districts, citizens and non-citizens alike. Brooklyn residents have submitted hundreds of ideas they hope to get funded in this year’s round. But only a tiny fraction of eligible voters actually participate, though the rate is increasing every year. This means a group of involved individuals who get out the vote have a greater chance of swinging money towards their project. Each councilmember gets about $5 million to spend as he or she sees fit. Of that pool, Councilmember Brad Lander set aside $1.55 million for voters to allocate in 2018. Carlos Menchaca, of Sunset Park and Red Hook, put up more than $2.8 million. Even if a project doesn’t win the vote, it might still get funded by other means now that it’s been identified, according to a study by the Urban Justice Center. Lander has added projects to his district’s budgets that were initially suggested in the participatory budgeting process. Voting runs from March 30 to April 7.